Karen Summerton wants to make as many people in the world as possible to laugh. And she's well on her way to doing so. 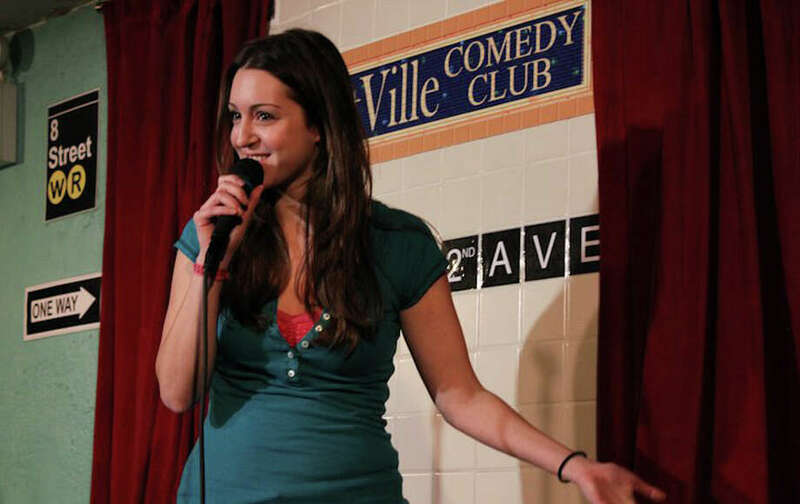 The Darien native, who graduated from Darien High School in 2002, had an early start toward her goal of being an actress, comedian and all-around entertainer. The first time she can remember being interested in show business was at age 5. Her parents regularly took her to movies and stage productions, and she remembers being enamored by shows like "Annie" and "Peter Pan." "I wanted to get on stage. I loved it," she recalls saying to herself and to her parents. A year later, she was auditioning -- her sister, too -- for a part in "Camelot" at the Darien Dinner Theatre. "I sang `Consider Yourself' from `Oliver.'" She was so excited when she got the part -- her sister didn't -- but the dinner theater filed for bankruptcy shortly after and she never played the role. She was disappointed, she said, but not completely upset because she had other activities that kept her show business interests alive. She took tap and ballroom dancing lessons and acting classes. As she grew older, she participated for two summers at Stagedoor Manor performing arts camp in New York's Catskills Mountains, where she made valuable connections. Among the alumni of Stagedoor are Natalie Portman, Robert Downey Jr., Mandy Moore and Michelle Federer. But she credits a lot of her early success to her years at DHS, especially Theatre 308 led by Nancy Herman. "There are some shows she puts on that are better than Broadway," Summerton said. She smiles when she recalls playing the Artful Dodger in "Oliver." Also during high school, she attended a theater camp led by Michael Coppola. She looks back on her time at DHS as giving her the foundation for her future career because people like Herman and Coppola embraced the kids' talents. "It was the best part of high school." Following graduation, she enrolled in Long Island University-C.W. Post, majoring in acting and broadcasting, the latter because she's always been interested in film. Perhaps a lesson learned from her businessman father, Summerton realized, astutely, that she would need to know the business side of "show business" too, so she immersed herself in everything related to becoming an entrepreneur. Her time in the radio and television studio at C.W. Post helped her to hone her skills as an actress and stand-up comedian and to do improvisation. She said her first stand-up comedy routine, however, came at age 15 when she was a part of a group of teenagers, brought together by Barry Halpin, who performed at the Rich Forum in Stamford. A freshman in college, Summerton performed at a comedy club in New York City, but she had nothing prepared so she just began telling stories. The audience "loved it," she said. "Being 17, I was so excited." Along the way, she met numerous experienced entertainers, among them Colin Quinn of "Saturday Night Live" fame, who she met at the Comedy Cellar. One of the greatest pieces of advice she has heeded from the veterans, she said, is to play with the audience and to "be truthful and be yourself" when performing. She has managed to make a living in her chosen profession and proudly admits she is "very fortunate" not to have had to do the traditional job to which fledging stars succumb -- waiting tables. Summerton, who comes home to visit often enough, now lives with her cat Nacho on the Upper West Side, which she quipped is "the Darien of Manhattan." She has a weekly Saturday gig doing stand-up at the National Comedy Theatre in New York City; is an active participate in the "Internet," an improv group of seven that performs wherever they can; and spends eons of hours seeking work. She recently mailed 1,000 postcards -- headlined with "Big News for Karen Summerton" -- to anyone who makes casting decisions. The postcard features her two most recent achievements. She was a central character in a Chobani yogurt commercial, which aired for the first time during the July 27 opening ceremonies of the London Olympics. She was a last-minute selection to play a farm girl in the commercial, and it was the chance she longed for, she said. "This was the defining moment," she said of seeing herself in the finished spot, adding that she considers the commercial one of her big breaks. The other success is the pilot that she shot for an MTV series called "You Had to Be There," starring stand-up comedians Nikki Glaser and Sara Schaefer, that got picked up. Shooting for the new late-night show is expected to start in the fall, said Summerton, with the first episode to air in January. She was told, she said, that the creators and directors hope to use her again for their skits. When she saw herself in the sketch, she said, "it was one of the best feelings ever ... I've never had an experience like that before." And she's done all of this without agent representation, although she's hoping that won't be a concern any more as she hopes to find an agent soon. With Bill Murray as one of her inspirations, a Summerton goal is to be on "Saturday Night Live," as well as to appear in serious films, television specials and a host of other venues. Wherever she finds herself, she said she has a simple philosophy: "To be able to creatively express myself constantly. To put my work out there and to put laughter out there. It's such a wonderful feeling. "For me personally, I have this drive -- what's the next thing I can do?"